Jared Hess, the director of cult smash hit Napoleon Dynamite and the more subdued (but fitting for Jack Black) Nacho Libre is set to do his next film titled Gentlemen Broncos. He co-wrote the script with wife Jerusha Hess which is about a high school outcast whoâ€™s an aspiring fantasy author, who attends a fantasy convention and discovers that his supposed masterpiece â€œYeast Lordsâ€ was ripped off by legendary novelist Ronald Chevalier, who has in recent years turned desperate for ideas. Set to star are Michael Angarano, Sam Rockwell and Jemaine Clement who stars as the novelist. 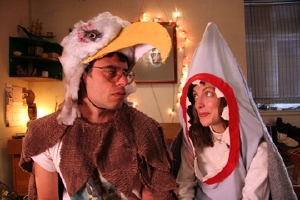 Jemaine is a great New Zealand comic and starred in Eagle vs Shark (pictured to the right), which if you haven't seen, I would highly recommend. Now if only we could get the guys from Stella in..